We knew that Ruby would need a dresser since Emma and Eli would be sharing so we moved ours downstairs and took a field trip to RC Willey and got ourselves a bedroom set. It is something that we have wanted for a long time so it was such a treat and we got it for a good deal. While we were shopping, we told Ruby she would get to have our dresser and she immediately got a look of concern on her face and said "But I can't reach the top drawers." Jed was home yesterday from work because he woke up with pink eye, but he still had to go into the office and sign checks, so while he was gone, Ruby and Emma did some coloring while I updated Ruby's name letters that go on her wall. They previously matched her crib set so I wanted to make them match her quilt. I love that you can applique on wood. It was so easy and it whipped up quickly. We will be hanging them on her wall today. As Ruby was coloring she decided to color Jed a picture with the complete confidence that it would make him feel better. it was so cute. When she gave it to him, he sang it's praises and I later found it in a place I least expected it, on our new dresser. The perfect place for it. If you look closely you can see where she signed her name. The girls also had a fun time dressing up on Wednesday, and I am so happy that they are so mindful of Emma and always include her. They are such good little friends. At my appointment, I was completely looking forward to having a small number on the scale because I thought that I had been so good. Obviously not. :) 5 lbs. in two weeks. Eli's heartbeat was 135 and I am measuring at 37 weeks. This measuring ahead business, kind of knocks me for a loop because with both of my girls I measured right on. And I either read way too much into it, thinking I am going to have a large baby, or that maybe he will be born early. I am driving myself crazy. The one thing I am looking forward to is that from now on my appointments will be a week apart as or March 9th. I don't remember being so tired with my girls. Once they are in bed I either crash in the love sac or fall asleep on my bed while reading, and then I wake up wondering how I fell asleep and how long have I been like this. I am also feeling like my patience is short. Last week when traffic was really horrible, Jed didn't think he would get home until well after 7 p.m. So we had dinner and played Hi-ho Cherry-o. Then we got settled in for bedtime routine, but the girls weren't cooperating. By the time I had asked them to get their pajamas Emma had successfully dumped out the 16 set of Dominoes which equals 252 dominoes that required picking up. Ruby offered to help while she was getting her pj's on, and while we were doing that Emma found the other set of Dominoes that we use for eye therapy and dumped them and then proceeded to bend the arm on Ruby's glasses. I got more upset than I should have. I was at my wit's end and went into my roomed and curled up on the floor on Jed's side of the bed so I could have a minute alone and started to cry. Ruby and Emma found me and the floor and Ruby stroked my hair and said "Mommy, are you crying because you weren't very nice to us?" That made me feel even worse, and they proceeded to say things like: "Don't cry, it's ok." "We love you, mommy>" "Don't be sad." I guess what I am getting at is that I think I am starting to understand slowly what the scriptures mean about becoming like a little child. Even after I got mad at them, they were concerned about me and wanted to make sure I was ok, even though I was the one who lost my temper. I am grateful for their forgiving spirits, and their love. I am also glad that Jed frequently tells me that I am beautiful, because more often than not, I feel so huge and awkward. Jed got the crib set up on Saturday, and I am starting to feel like we have all of our ducks in a row. We are moving our dresser downstairs to Ruby's room tonight so that Eli and Emma can share the dresser upstairs, and to make room for our little purchase that is being delivered tomorrow. I can't wait! I feel like 6 weeks is such a long time, but I know that as I look back on it, it will have gone so quickly and I will wonder where the time went. Life is like that most of the time I think. Since Jed worked his birthday on Thursday we had an extra long weekend and got to spend Friday as a family. Ruby was thrilled that Daddy got to pick her up from school. In the afternoon we drove to Riverton to drop the girls off at Jed's mom's school. We exchanged cars with her and headed off to our movie. Jed loves driving his moms car and says he feels like he is in a sports car. (Compared to our van, it seems quite understandable.) Jed was so funny the whole way there because we were running a bit late. He would often go into his high pitched voice filled with anxiety and rattle the steering wheel when people got in our way or slowed down. It was quite comical and we pretty much laughed the whole way there. We got to the theater and we knew our movie had already started. So we sped walked as quickly as I allowed us too and headed to our seats. At first I as nervous because I hate walking in the dark when I can't see, and I don't like walking in front of people. Our seats also weren't very accommodating to my urgent bladder. So I was worried about that too, since the movie was almost 3 hours long. I also got a little motion sick because of the 3-D so occasionally I would have to flip up my glasses. When I get motion sick I get really hot and sometimes it makes me throw up. So I was starting to get really hot, I turned to Jed and asked if though it would be a big deal if I took my shirt off as I had a Modbe underneath it. I did so and felt much better. So with all of that happening I was thinking that I wasn't going to enjoy the movie. I was quite wrong. Avatar was incredible!!! I was completely expecting it to be sci-fi-ish and I would be confused. The story was so well done and the graphics, where do I start? It didn't seem like a 3 hour movie at all. I love, love, loved it! Can't wait until it comes out on Blue Ray. After our movie we went to Texas Roadhouse and were told we had a 75 minute wait. We reserved our spot and headed over to the mall. We did a bit of browsing and then Jed wanted to look at some shoes for work. We found the perfect pair, but the wrong color. They were able to order it and ship it to our house for free. Jed is looking forward to his purchase coming. By the time we were seated, I was so thirsty I finished two glasses of water and a cherry limeade and then I was full. So I think I ate 3 bites of my steak and 2 fries. It was so nice to be able to get out on a date and just be together. The last time we did that was 3 months ago on our anniversary. We were so grateful for Brent and Suzanne giving up their Friday night so we could go out. The girls had so much fun with Luke and Ellee, and talked constantly about going to see Grandma and Grandpa. So sad that you have to work on your birthday, but am so happy that you get to have a three day weekend and a day off tomorrow! I am looking forward to our very unquiet dinner with our girls tonight and a rousing round of Happy Birthday, with a side of ice-cream. Very often I feel guilty when you have to get up early and leave for work while I am still laying in bed with the girls while Ruby is sugesting we play a Disney character guessing game. I realize that you have set aside many of your dreams so that we can have our dreams. You really do sacrifice so much for me and our girls and Eli. I am so thankful for that telephone call almost six years ago when you asked me if I wanted to go out with you, and during the conversation you told me I had to pick what we did because I was the picky one. (You know how to call'em.) I think I just got done watching the A&E version of Pride and Prejudice and I insisted on calling you Mr. Romig, while we enjoyed conversation over Iceberg milkshakes. My dreams began to come true that day and the fear that I would be alone my whole life subsided. Because of you I am living my dreams. I sometimes wonder how many of your own dreams you have set aside or cast off so that we could have our dreams. 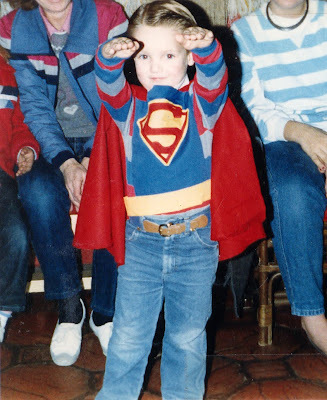 You will always be my Superman, and I will do my best to be your Lois Lane. I started on Eli's quilt Tuesday night, by cutting the fabric into squares. Thursday I sewed it all together, I had lots of time due to Ruby's friend visiting for a few hours and then the girls wanted to color while I sewed. It was most convenient. Thurs. Fri, and Saturday morning brought Eli's quilt to a concusion, it left me with sore fingers after snipping all of the seams. It ended with a trip to the washing machine. So glad to have it crossed off my list of things to do. Jed picked the fabric, which I love. He has a better eye for these type of things. Jed also got the crib moved out of Emma's room and into Eli's, with only a few blemishes to the wall later. :) Now it just needs to be put back together. Emma has been most interested in getting into Jed's "comfy" drawer and putting ensembles together. It is so funny to me how tiny she looks in them, we had a good laugh when I showed them to Jed. Ruby made homemade Valentines for her school class this year. It was a fun project along with having a few of the dum-dums while we were putting them together. If you can't tell, they are little owls that say "I'll owl-ways be your friend!" Saturday we did some much needed shopping for work pants for Jed (which he insisted he didn't need even though he had to be careful how he sat so no one would have to avert their eyes if the very large hole in bummel area made an appearance.) We also got to shop for Eli. It was glorious and Jed had to approve all of the selections. We pretty much cleaned out the baby boy section at Costco, because a)they were so cute and b) they were extremely reasonable. Good combination. We also made Valentines a family affair this year since Jed's birthday is the week after and we are too cheap to celebrate both holidays. We ended our shopping extravaganza with a trip to McDonald's for ice-cream . I of course got to have a few extra treats since I opted out dinner at Costco, because I knew there was the possibility of a Mcdouble being on the horizon. Oh how I adore them. The girls thoroughly enjoyed their treat and playing in the play place. It was perfect, it gave Jed and I little while to talk while the girls played. Yesterday I had my 32 week appointment even though I am 31 1/2 weeks. I get so excited for appointments and then they are over within 5 minutes, and then it feels like forever until I have another one. Now I am down to my every 2 week appointments and then at 36 weeks I will be to once a week. Which I love. I am measuring at 34 weeks, Eli's heartbeat was 145 and I have now put on 30 lbs. I am embarrassed to admit but for the purposes of remembering, I am sure I will want to know what I weighed at this point in my pregnancy for at a later date. I am now in the marshmallow stage which will soon be followed by the "puffed up like a toad stage." We ventured out to the park one day last week, lets just say we were under dressed and freezing after being there for about 15-20 minutes. I think the girls enjoyed the time outside and getting to play. The girls got a new do on Saturday. I love the way it looks on both of them, and it is such a breeze since all I have to do is round brush while I blow dry it. They both look so cute. Ruby has been making friends as I mentioned earlier. It is such a fun thing for her and I think she is really enjoying this new stage. As I am writing this she is over at Hannah's house, they are in the same Primary class. Last week when we had Julianna over the girls dawned on dress ups and took the liberty of borrowing the camera. It was quite the surprise when I found these little beauties as I was emptying the memory card. I felt a smidge guilty this morning when we woke up and realized that it was 8:26. Nine minutes before we were suposed to be out the door on our way to preschool. We NEVER sleep in like this. I was up late cutting fabric for Eli's quilt, so that is my excuse. I remember Jed saying goodbye and both of the girls being in bed with me. When we awoke, to Emma saying "Oh NO!" because Jed forgot his phone, I picked it up and looked at the time and realized there was no way we would make it. So we played hooky today, it was actually quite fun. Every evening while dinner is cooking, I revel in being able to cuddle with my girls during t.v. time. 1) they are really fun to cuddle with and 2) by this time of the day the dogs are barking. I really find joy in these simple times with my girls. And at the end of the movie they always entertain me with their great dancing while the credits are playing. 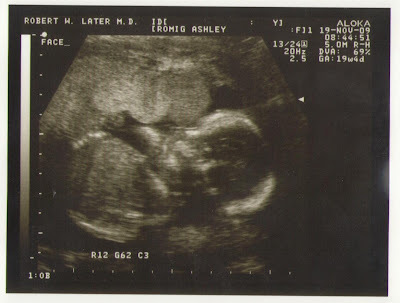 If you recall, I said I would post a picture of Eli's ultrasound about 11 weeks ago. It never happened and I just saw it in our photo folder on our computer so I figured better late than never. Jed picked out the fabric for Eli's rag quilt. I love it, he did a good job. Hopefully I will have it done in the next two weeks or less. This weekend we had a lot of fun, my nephew Brody had his 1st birthday and we had a ton of fun playing games. I think one of my most favorites was the baby picture game. It was so funny to see, how into it all of the Romig relatives got into it. Jed would hold 3 or 4 in his hand like he was playing cards and then write names down. It was so fun. Lots of laughs. And the cake, oh the cake. The girls had such a good time and loved seeing the cousins. I am sure it was difficult for Sarah to get good pictures due to all of the cousins crowding around Brody to see what he was opening. I feel like I am doing some early nesting. More or less I know there are things I want done and organized and that I better get it done before Eli makes his appearance. I did laundry, dishes, tore into storage room and threw out all of the excess boxes and items that we didn't need,organized all of the books onto the bookshelf we got from Grandma Ruth, and did some organizing in our closet. After I was done. I was ready to go to sleep and my back was hurting. But it felt good to get a few things done. We also took a walk to City Hall to pay our utility bill. Jed got Ruby's bike put together from her birthday, and we put Emma on her tricycle and made the attempt. It took a very long time. After we got about 1/2 a mile Emma didn't want to ride her tricycle anymore and Ruby was frustrated. So Jed put Emma on his shoulders and ran the rest of the way, while I carried Emma's tricycle home and encouraged Ruby the rest of the way home. It took Jed quite a while to get back due to Emma falling and bonking her head on the sidewalk and needing to be cradled the rest of the way home. She fell asleep in his arms though. Note to self: City Hall is a lot further away than it seems. Ruby gave a talk in Primary yesterday. Emma was home sick, so I got to help her give it. Our Primary meets in the chapel because it is so large. So I got to stand at the pulpit and help her. I was burning up up there. My face felt so hot. Enough about me though. Ruby did an excellent job. I was so proud of her. She talked about Jesus Christ is Heavenly Fathers son, and talked about three accounts of when people have either heard or seen Heavenly Father bear witness of Jesus Christ being his son. Then she talked about what she could do to strengthen her testimony and follow Jesus. She colored a picture of a girl being baptized and colored her face green. I loved it. I love these moments when our children get to share what they have learned and gain confidence in themselves. It was so sweet. Just a little shout out to Angie, we had this lesson a couple weeks ago in FHE (Angie made us a complete book of a year worth of FHE lessons geared toward smaller children that corresponds with this year's Primary theme month by month, she is nothing shy of amazing. THANK YOU ANGIE!) and felt like it would go perfectly. I also finished binding Emma's quilt. So happy to have it done. I finished it last night, while watching bonus features from Cinderella. It is now on her bed and I feel most accomplished. I love the look of it. Special thanks to ERIN who held my hand most of the way on the project of starting and completing the girls quilts. She spent a lot of time teaching me and walking me through the process. We had some great neighbors move in up the street from us. They have a little girl Ruby's age and they play so well together. The funny thing is that I grew up her dad kind of. He is older than me, so more or less I grew up with his younger sister but we grew up in the same ward. It is such a small world.